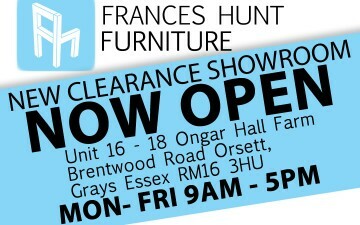 UK Locations, Frances Hunt deliver all over the UK. At Frances Hunt we offer a variety of delivery solutions designed to meet your high expectations. Most of the time deliveries take place on our own vehicles to ensure your items get to you in perfect condition. We employ our own drivers who most of the time will be delivering your furniture. If you use this service you can expect your item to be delivered safely to your front door. For Standard Deliveries you be allocated a morning or afternoon delivery slot. We will inform you the day before your item is due to be delivered, in addition to this we will call you usually an hour before delivery. Deliveries usually take place Monday - Friday, 8am - 6pm. Saturday delivery is usually restricted to London & the Home Counties (see additional services below), however by special request we will make every effort to fulfil your needs. Please contact us on 01375 893 422 for further details. Please Note: there will be a standard delivery charge of £12.50 on all Special Offer items - this will be slightly more for express delivery. Many of our items are now available on Express Delivery. This means we are able to get your item to you quicker than the normal lead time as stated on the website. Express delivery information is specific to the product you are ordering, further information can be found on the product page and is subject to stock availability and your location. If you require delivery on a specific day please call us for further information. Our special White Glove Service is available on all deliveries by our drivers and includes everything you would expect from a Standard Delivery plus item/s carried to your room, assembly of furniture if required (either on site or beforehand at our distribution centre) and removal of any packaging. Please contact us on 01375 893 422 for more details. Saturday delivery is now available for many items of furniture at a small extra charge. If this option is available it will be displayed at checkout when placing your order. Please note: this will be the first available saturday we are in your area. As part of our white glove service, we are able to assemble your furniture (if not already assembled) either at our distribution centre or at your location. If you require this service please contact us prior to placing your order. Delivery costs associated with your transaction are explained at the top of this page. If you are not sure then please dont hesitate to contact us prior to placing your order. Delivery lead times are only an approximate estimation and are subject to change, unfortunately this can be sometimes out of our control, if you have any doubts please call us before placing your order. If you have ordered items to be delivered to Scotland or Wales you may have to wait longer than the quoted time on the website. If you have any special requirements regarding your delivery please dont hesitate to call us on 01375 893 422 and we will do our best to fulfil your needs. We deliver to all mainland areas within the UK. View some of our most popular UK locations below.